Headline Filters is the largest European manufacturer of bonded microfiber filter elements and associated filter housings and have been working with Broanmain for a number of years. Customers, for various reasons, often have a need for external stock management. Sometimes the need is to ensure production efficiency, for example, a production line may require the holding of a quantity of stock ready for use. In other cases, space limitations on a customer’s site mean they cannot hold stock or a customer may want to minimise their own storage function. 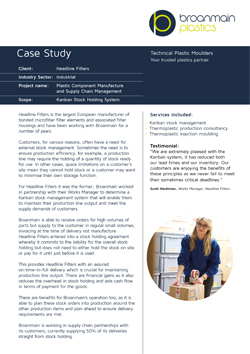 For Headline Filters it was the former; Broanmain worked in partnership with their Works Manager to determine a Kanban stock management system that will enable them to maintain their production line output and meet the supply demands of customers. Broanmain is able to receive orders for high volumes of parts but supply to the customer in regular small volumes, invoicing at the time of delivery not manufacture. Headline Filters entered into a stock holding agreement whereby it commits to the liability for the overall stock holding but does not need to either hold the stock on site or pay for it until just before it is used. This provides Headline Filters with an assured on-time-in-full delivery which is crucial for maintaining production line output. There are financial gains as it also reduces the overhead in stock holding and aids cash flow in terms of payment for the goods. There are benefits for Broanmain’s operation too, as it is able to plan these stock orders into production around the other production items and plan ahead to ensure delivery requirements are met. Broanmain is working in supply chain partnerships with its customers, currently supplying 50% of its deliveries straight from stock holding. Traditionally, exterior components on our machines were cast from Aluminium, injection moulding was never an option due to low volumes and high tooling costs. Wilf and the team at Broanmain encouraged us to review this way of thinking as they were able to offer a range of durable materials and sensible tooling prices. We started several years ago with one component and now have over twenty two components in series production. In addition to the component cost benefits, we receive all parts on a JIT basis which keeps stocks low and provides flexibility. We are extremely pleased with the Kanban system, it has reduced both our lead times and our inventory. Our customers are enjoying the benefits of these principles as we never fail to meet their sometimes critical deadlines. During the delivery of a series of enclosures for a major new product introduction, Broanmain have developed a comprehensive kitting and printing process tailored to our needs. This has allowed Trend to significantly reduce both material and labour cost compared to the previous generation of products. The biggest advantage of working with Broanmain is the fact that the supplier customer relationship is seen as a true partnership which greatly aids all aspects of developing and sourcing products. Wilf and his team were the first to install confidence in me that the intricate detail and functional requirements for my product would be properly considered and managed. Not only did we make improvements to the actual product, but were also conscious of production efficiency and appropriate materials to ensure product quality whilst keeping costs down. I would recommend Wilf and his team at Broanmain Plastics to any individual or company who has a product to take to market.